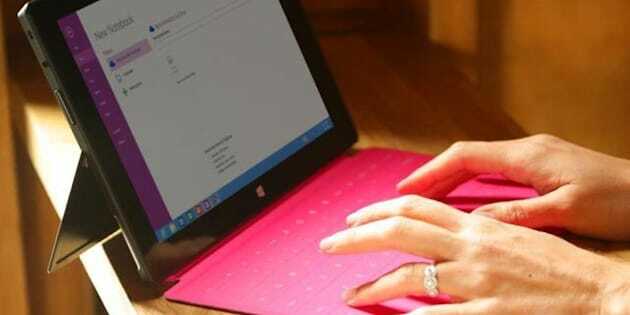 What It Is: The Surface Windows 8 tablet is a laptop and tablet in one. Getting into the specifics, the tablet is about two pounds, 6.8 inches in height, 10.8 inches in width and sold in both 64 and 128 GB at most retailers. The tablet runs on Windows 8 and along with being a touchscreen device, it also works with your Windows 7 programs or applications. Trying It Out: When looking for a tablet, I wanted something simple: A device to read with, browse the web and watch videos. I also wanted something lightweight and portable. I'm not a big fan of carrying my mouse around with my laptop — so all those extra "pieces" should be minimal. The size was a little too big — for a tablet at least. For my own use, I would've preferred something smaller in size. However, when it came to typing, size did matter. Since the tablet can rotate, it was easy on the fingers for typing. Next was the quality of photos and videos. For a tablet, I thought the images worked well. Pictures were easy to scroll through (I tested out saving a few in a folder), and videos online were quick to upload. The photo quality for the built-in camera was average — but I've never been a big fan of taking photos with tablets to begin with. (Taking self-portraits with them are even more awkward). The tablet also included a cool travel tool that let you browse different cities and their go-to spots — pretty neat. The keyboard was probably my favourite feature. I got to play around with a few colours and they were lightweight, slim, and well, fun to look at. For the most part, keyboards are sold separately and start at $119. To test out speed and functionality, I tried following this tofu lettuce bowl recipe from The Pioneer Woman. Keeping it far away from the counter (I was scared to get it dirty) and using the tablet's kickstand made it easier to browse though the page and read instructions. Tips: Depending on what you're looking for, this tablet isn't the most practical device for everyone. If you're looking for a laptop and tablet in one, it might be a good start. The device's size, weight and keyboard addition make it a good option for a laptop. For a tablet, however, I would prefer something smaller.